Long live the 69 years of the Great Chinese Revolution! Today, October 1, marks 69 years of the Great Chinese Revolution. This was an extraordinary event for humanity, in which millions of people led by the Communist Party of China and its leadership, the Great Helmsman Chairman Mao Tsetung, took power across China after a Prolonged People’s War that overthrew the power of the big bourgeoisie, latifundia and imperialism, building New Democracy and Socialism in China, bringing light and hope to the proletariat and popular masses throughout the world. We reproduce the following article published by the newspaper A Nova Democracia on the 60th anniversary of the victory of the revolution. The colossal celebrations of the current Chinese fascist state to commemorate the 60th anniversary of the founding of the People’s Republic of China were intended to conceal the fact that the largest population of the globe has lived, since the counter-revolutionary coup of Deng Xiaoping in 1976, under the cruelest regime of exploitation, integrated into the capitalist economy and largely responsible for the survival of capitalism in crisis worldwide. Today China is a capitalist country, with a fascist state that imposes infinite repression and exploitation on the people. However, nothing can erase the memory of the revolution that liberated the Chinese people, marked by the founding of the People’s Republic of China on October 1, 1949. That is the history that deserves to be remembered.All those who today are impressed by the strength of the Chinese economy, with its very high rates of growth relative to the rest of the world, forget that this is due to the use by the bureaucratic Chinese bourgeoisie of all the structure and achievements left by the revolutionary process that developed until the death of Chairman Mao Tsetung in 1976. Under the influence of the October Revolution of 1917 in Russia, the Kuomintang-led revolutionary movement, led by Sun Yat-sen, a bourgeois nationalist who was attempting to carry out the bourgeois revolution of the old type, grew. In 1919, the May 4th movement erupted. On July 1, 1921, the Communist Party of China was founded. In that same year, the government of Canton emerged, whose president was the revolutionary leader Dr. Sun Yat-sen. Then, the workers and peasants established an unbreakable alliance and begin to evict the large landholders. Sun Yat-sen’s party received support from the Communist Party of China in 1923. Chiang Kai-shek, a young soldier returning to his country after completing his studies at the then Federation of Soviet Socialist Republics, took command of the Military Academy of Wampoa, which was the nucleus of the revolutionary army of the Kuomintang, in 1924. Dr. Sun Yat-sen died in 1925 and Chiang Kai-shek took control of the Kuomintang, stirring up the contradictions between communists and nationalists within the bourgeois party. The expedition to the North began with the enthusiastic support of the peasant masses in 1926. In the same year, Chiang Kai-shek arrested countless Communists. In 1927, forces led by Chu En-lai are shattered by the Kuomintang. On April 12 of the same year in Beijing, Chiang Kai-shek betrayed the revolution. The Kuomintang unleashed violent repression, using siege and annihilation campaigns, immediately killing 5,000 people, including communists and allies. Chu En-lai is released through mediation. Between May and June 1927, there was a new bloodbath against the Communists. In 1928, communist columns led by Mao Tsetung and Chu Teh merged into Chingkanshan, giving rise to the Red Army of China. Those days were decisive for Chu Teh to become a military genius and Chairman Mao the top political theorist of the revolution in China. The bases of support progressed, meticulous plans for deepening the power, economy, and culture of the broad masses, while Chiang Kai-shek accumulated fortunes, bureaucracy, and trained reactionary troops in the areas under his rule. In January 1930, in Fukien Province, Chairman Mao was recognized as the top leader of the revolution in China. Also at the beginning of this year, the military organization of the Red Army was established, with troops divided into four bodies, totaling 30,000 men. The central executive committee of the Communist Party of China was reorganized with a revolutionary military council. Before the end of the year, Chu Teh organizes small units and strikes 100,000 Chiang Kai-shek soldiers grouped in eight divisions that were directed against the bases of support of Hunan and Oyuwan. Chu Teh makes 10,000 prisoners. The second and third siege and annihilation campaigns are taking place, however, with the victory of the communist-led workers ‘and peasants’ army. 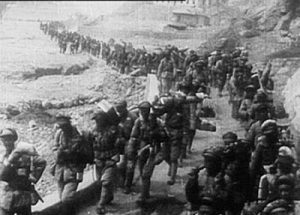 In the third campaign, Chiang Kai-shek had reduced Chu-Teh’s forces from 30,000 to 20,000 men, at the same time as enabling the Japanese to invade Mukden in September 1931. Chairman Mao declared war on Japan. 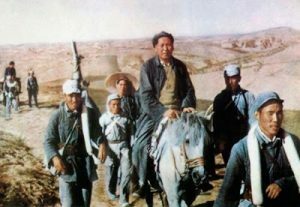 About 20 thousand nationalist soldiers from the 28th Kuomintang army defected and joined Mao Tsetung’s worker and peasant army. In April 1932, Chiang Kai-shek had 500,000 men to attempt, in his fourth encirclement and annihilation campaign, to destroy the army of the workers and the peasants, but retreated in January 1933. A fifth campaign is launched by the Kuomintang, with technical advice from the German general von Seeckt. The campaign lengthened until 1934, with Chiang Kai-shek abandoning all resistance to Japan, which seized Manchuria. The Red Army prepared their march of fighting for the mountains of Shensi, more than 10 thousand kilometers away, traveling an average of 40 kilometers per day. The I, II, and III peasant armies joined the Red Army and victoriously completed the Long March of 25,000 lis*. Long March. Since mid-1934, this army defeated 18 chains of high mountains, five of them covered with snow; crossed 24 great deep and stormy rivers; twelve provinces located in inhospitable regions, in which it temporarily occupied 62 cities, arriving at North Shensi in October of 1935, where it established its unbeatable bases of support of the great northwest. With approximately 35 thousand combatants, the Red Army defended the region comprised by the provinces of Kansu, Suiyuan and Shensi. To the south of Shensi, Chiang’s 15,000 soldiers launched isolated attacks against the Chinese people’s army. Behind Chiang’s lines, however, Japanese forces attacked the Kuomintang. 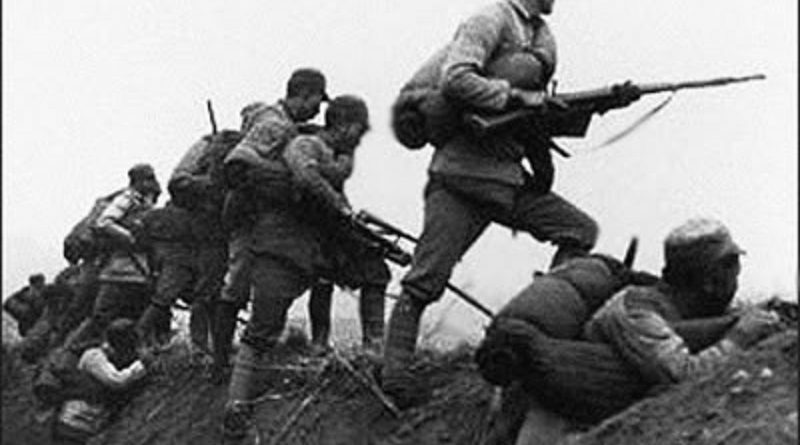 Skillfully, The Red Army ceased its hostilities to the Kuomintang’s worn-out forces. It gathered civilian and military cadres, developed their industries and agriculture, and created a military school. Occupied since 1931 by the Japanese, Manchuria witnessed the imperialist reinforcements that came to its territory constantly until March 1932, when – by “British mediation” – the Japanese withdraw. The revolutionary army is constantly expanding in the meantime. By the end of 1936, 100,000 revolutionary fighters occupy northern Shensi. In January 1937, Yenan was declared capital of the People’s Republic of China. Nanking was the seat of government of the Kuomintang. After a set of incidents – created by the Japanese to justify a series of massacres perpetrated by them – on July 30, 1937, the Japanese imperial army occupied Pekin and, on December 13 of the same year, Nanking. In the same year, in Shensi, the Japanese troops are defeated in September and October. Then they unleashed a major offensive on all fronts. In 1939, troops under Chairman Mao occupied vast territories and established peasant and labor power there. Chiang Kai-shek intended for the Red Army to become worn out in confrontation with the Japanese army, to ally with them and to destroy the army of workers and peasants. But these revolutionary forces forced the Kuomintang to play the worn-out role. The Red Army strengthened to face both enemies. In 1940, the Red Army of workers and peasants had half a million men guided by an invincible political line. Moreover, they were well-armed and trained. The offensive against the invader was launched intermittently and safely, bringing losses to the Japanese Fascist army that amounted to 50,000 men, including Japanese and Chinese forced to fight alongside them. To the imperialist disaster were added losses of numerous fortified points, miles of railroads and the political dominion of immense regions. Between 1939 and 40, Chairman Mao Tsetung became the undisputed leader of the communists and the Chinese people. In 1941, the Second World War became widespread. That year, the USA launched a series of provocations against the Japanese, forcing them to attack the Yankee Pearl Harbor base in the Pacific. In 1942, 43 and 44, the communists broadened their range of action, gradually developing production, supplying arms and ammunition. Concerned about the islands in the Pacific, the Japanese gave priority to the defensive in China while they sacked it, putting into practice the slogans of “stealing everything, burning everything, killing everyone”. The Workers ‘and Peasants’ Power was advancing. The Party and the liberated regions grew. Schools of political and military cadres are enlarged. In 1944, just in northwestern China, the Shansi-Chahar-Hopei Power included 20 million people. It was 1945. 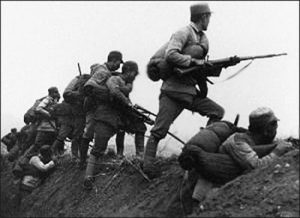 At the end of World War II, the Kuomintang troops had 280 brigades. A total of 2.5 million soldiers, counting on a small navy and five hundred airplanes. The Communists reached 300,000 soldiers, supported by 700,000 guerrillas. Chiang’s entire public administration was undermined by the forces of the people. The revolutionaries were waiting only for the order of attack. On June 30, 1946, the civil war was crystallized. Between July and August, the communist forces seemed to retreat, but in reality, they strengthened among the masses, creating the possibility of all the people getting involved in the war. May 10, 1947. The peasant and worker army launched a stupendous offensive across China. In December of the same year, the bloodiest struggle of the whole civil war took place between the Yellow and the Yangtze rivers. Attacking behind enemy lines, establishing blows that divided the Kuomintang’s forces into smaller, fragile slices before a crushing red contingent, Chiang’s forces lost more and more supplies and men. In September 1948, a remarkable military leader who had begun his exploits at the age of 16 as Chu Teh’s aide-de-camp, took command of 600,000 soldiers. With this contingent, Lin Piao seized Chiang’s garrisons and fortified points between Mukden and Chinchow. In November, Chiang’s positions were crushed by successive, simultaneous, and endless attacks advancing toward southern China. When January arrived, Chairman Mao offered peace, which the Kuomintang reactionaries rejected. Maintaining the demand for peace, however, the Red Army continues to dominate and attack. Yankee imperialism’s support for Chiang was of no avail. Nanking, the capital of the Kuomintang, fell on April 13, 1949, Hankow on May 3 and Shaoshing on the 7th. Finally, on December 4, on the border of Indochina, 25,000 Kuomintang soldiers surrendered while the traitor Chiang had taken refuge since April 23 on the island of Taiwan under the protection of Yankee imperialism. On October 1, Chairman Mao Tsetung proclaims the People’s Republic of China in its capital, Beijing. China’s revolutionary proletariat provided tremendous contributions to the First Proletarian Revolutionary Wave in the world (1848-1976), with President Mao’s thought as a guide – ever since the founding of the Communist Party of China in 1921; the creation of the Red Army; of the Harvest of the Autumn Harvest in 1927; of China’s liberation to the founding of the People’s Republic. In fact, Chairman Mao established the strategy of the siege of the city by the countryside; founded and directed the People’s Republic and the style of new democracy. Going beyond the period focused on by opera, the history of the world proletarian revolution, during the struggles in China, not only raised the question of armed rebellions to the level of the military theory of the proletariat but boosted a new economy, a new politics and new culture. At the head of the Great Leap Forward was Chairman Mao; a guide to the struggle against modern revisionism and against all sorts of doctrines of capitalist restoration; chief and commander of the Great Proletarian Cultural Revolution; established the contradiction as the fundamental law of dialectics; developed the thesis of bureaucratic capitalism – capitalism that develops in nations oppressed by imperialism with its varying degrees of feudalism. He deepened the Marxist-Leninist theory of the state (from the three instruments: the Party, the Army and the One Front), like that of the class struggle under socialism. On the plane of the World Revolution, even under the cruelest ebbs, he clarified the question of the three worlds that are outlined and the inexorable victory of peoples under the hegemony of the proletariat. His contributions have never been a set of deliberate and artificially engineered phraseologies to attend to the power of an elite or one man and serve a few followers who come and go with the passing of time. On the contrary, he took the social practice of millions and millions of proletarian revolutionaries from all over the world (from the previous revolutions and the part he was to lead) as a criterion of truth in the search for and building of a new society free from the exploitation of the masses and from the existence of classes. * Li – Chinese unit of measure of distance, equivalent to 576 meters.